Heat over to 350 degrees. Cut pocket lengthwise along thickest side of tenderloins. Mix bread cubes, onion and pepper with brother to moisten, stuff into pocket. Wrap 2 slices bacon around each tenderloin and fasten with a toothpick. Place in a greased baking pan. Salt and pepper to taste. Bake uncovered 1 hour until meat is no longer pink and stuffing is hot. 3-4 pounds chicken fryer, cut into serving pieces. Combine all ingredients but the chicken. Bring to a boil. Remove from heat and keep hot. Arrange chicken on the grill and baste with the sauce frequently. Takes about an hour to grill outside in a covered Weber or gas grill. To prepare chicken for barbecuing, sprinkle both sides of chicken halved, quartered or pieces, with salt and pepper and Accent. Place skin side up on grate set 6 inches from heat. Cook until tender, turning occasionally. (I usually turn about every ten minutes.) Allow 45 minutes to 1 ¼ hours total cooking time. Brush with barbecue sauce last 30 minutes of cooking time. Pieces should feel tender when poked with a fork. Garnish with lime slices. Rinse wild rice under running water using strainer or in a bowl of water; drain. Place wild rice in a heavy sauce pan with salt and water. Bring to a boil; simmer, covered until kernels open slightly or about 30 to 40 minutes. Drain. Spread rice in buttered 8 X 12 baking dish. Combine soup, sour cream, mushrooms and sherry; pour about half of soup mixture over rice. Arrange chicken over the soup. Spoon remaining soup mixture over chicken. Sprinkle with Parmesan. Bake, covered, in a 375 degree oven for 30 minutes; uncover and bake until heated through--about 30 more minutes. Sauté broccoli and onion in the margarine until soft. Combine remaining ingredients in a bowl, omitting the meat and mushrooms if desired. Add the sautéed broccoli and onions. Pour into a small baking dish and bake at 350 degrees F. for 1 hour. Heat oven to 350 degrees. 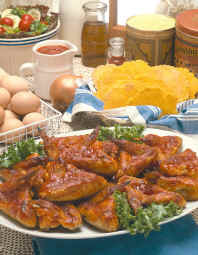 Place Chicken in lightly greased 13 X 9 casserole pan. Mix chicken soup and tarragon and pour over the chicken. Arrange peas and carrots over top. Mix flour and baking powder in a bowl. Add buttermilk and butter. Stir to form thin dough. Pour evenly over chicken mixture. Bake uncovered 1 hour until crust rises and browns lightly. Grandma Ladely always made this frequently. 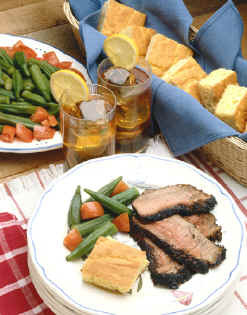 Living on the farm and having plenty of chickens to eat, there were many ways to prepare this meat. Idea: Try adding white grapes or pineapple and some slivered almonds. Melt the margarine, stir in the flour, then slowly add the broth/milk liquid. Serve over the patty shells. Grandma Ladely made this a lot for potluck dinners and company. Always a smash hit. Place chicken in greased large cake pan 13"X9". Cover with the dressing. Pour gravy over dressing. Bake 35 minutes at 350 degrees. Cut into squares and garnish with fresh parsley. Layer the chicken and broccoli in a greased pie plate. Pour the blender mix over the top of this. Add the topping; bake at 400 degrees for 15 to 20 minutes. Mix all together and form into 4 or 5 patties. Broil or grill brushing either with butter or bar-B-Q sauce till done. Sauté bacon in Dutch oven medium heat until partially crisp. Cut turkey tenderloins into 1 inch pieces. Add turkey, sauté until meat is no longer pink. Add carrots, onion, celery, 1 ¾ cup water, chicken broth, rosemary and bay leaf. Bring to a boil. Reduce heat, cover, and simmer 20 minutes. Blend flour and remaining ¼ cup water. Stir into stew mixture. Bring to a boil, stirring constantly until thickened. Remove bay leaf. Salt and pepper to taste. Mix up the biscuit mix and milk. Drop by rounded tablespoons into stew. Cook uncovered, 10 minutes. Cover and cook 10 more minutes until dumplings are puffed and done.